The old must go, and the new ought to arrive. The time has come for the five year old Bose QuietComfort 15 Acoustic Noise Cancelling headphones to finally call it a day, especially when you take into consideration that its successor, aptly known as the Bose QuietComfort 25 Acoustic Noise Cancelling headphones has just been announced, where it delivers next generation performance that will boast of an entirely new design, as it goes about merging better noise reduction and audio performance thanks to a stunning new look and greater portability. 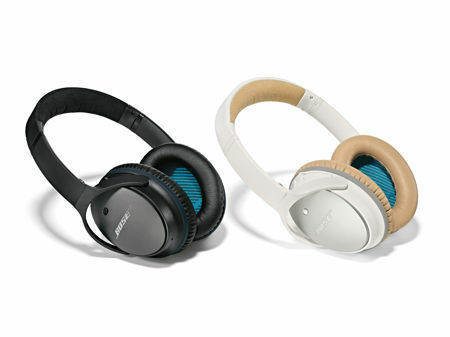 Touted to deliver a brand new standard for performance, just about every single dimension of the Bose QuietComfort 25 headphones have been improved, ranging from greater noise reduction to lifelike audio, a striking new profile and styles, and a new earcup pivot that can fold up smaller than ever. In a nutshell, Bose was not going to let the QC15 headphones call it a day until the company itself has churned out something that is a whole lot better – and different, of course, which are categories that the Bose QuietComfort 25 is able to fulfill without batting an eyelid. The QuietComfort 25 headphones will glean its capabilities from more than 30 years of ongoing research, where it can cancel more noise than any other Bose consumer headphone in history. There are also other kinds of audio advancements that will help reproduce music with improved clarity and accuracy, in addition to a more finely tuned Active EQ that delivers a demonstrably smoother frequency response across the full spectrum of sound, regardless of listening level. Not only that, TriPort technology will be able to deliver deep, detailed low notes, while a lower noise floor helps to further reduce the common “hiss” that is normally associated with conventional active noise cancelling headphones. Do expect the Bose QuietComfort 25 headphones to be powered for up to 35 hours on a solitary AAA battery, and if the battery runs out of juice, it will not stop the Bose QuietComfort 25 from working on. The asking price for this beauty? $299.95 a pop from the beginning of this month onward.